Broken Blossoms, D.W. Griffith’s tragic tale of love and brutality, opens with Chinese native Cheng Huan (played by Caucasian actor Richard Barthelmess) expressing his desire to travel to the land of the white man, where he will deliver the loving message of Buddha to the masses. Aghast at the behavior of white sailors stationed in China, Huan is convinced he can help these people, but his hopes are dashed shortly after his arrival in London, where people look upon him as little more than a meddlesome foreigner. Before long, Huan's reduced to running a Chinese trinkets store, and smoking opium to pass the time. Battling Burrows (Donald Crisp) is London’s boxing champion, yet his brutality isn't limited to the ring. He has a young daughter named Lucy (Lillian Gish), who we learn was “thrust into his arm by one of his girlfriends” 15 years earlier. Burrows abuses and torments Lucy, and the young girl is so distraught that she can’t even muster a smile without using her fingers to curl the corners of her mouth. Huan's been watching Lucy through his store window, and has fallen in love with her. Following a particularly savage beating from her father, Lucy staggers into Huan’s shop and collapses. Huan cares for her, showing Lucy an affection she has never before experienced. But as she’s recovering in Huan’s shop, one of Battling Burrows’ friends spots her, and rushes off to inform Burrows of his daughter's whereabouts. an enraged Burrows, who’s training for a match across the river, vows to return after his bout and take his daughter away from that “dirty chink”. The ensuing scenes of violence and despair have lost none of their potency, and will undoubtedly move even a modern, admittedly more jaded audience. To be sure, I found Broken Blossoms a bit difficult to watch at times, due mostly to its constant stream of racist remarks (upon its release in 1919, the film had the alternate title in some western areas of “The Chink and the Child”). Even Lucy, as she[s being tended to by Huan, asks “What makes you so kind to me, chinky?” However, Griffith (no stranger to controversy thanks to his earlier Birth of a Nation) took what I must believe was a great chance in making this film. Despite the above slurs, the famed director successfully portrays Huan in a very positive light, and even gets a few jabs in at Western hypocrisies along the way (When a priest friend greets Huan on the streets of London, he informs Huan that his brother, also a priest, is traveling to China to convert the “heathen”, a clear contradiction to everything we’ve experienced of both cultures thus far). 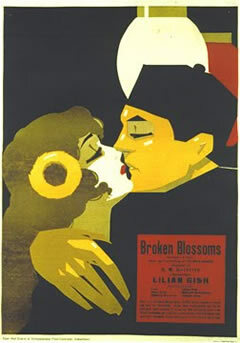 Taking into account the film was released in 1919, Griffith must be commended for presenting a love story that crossed cultural and racial boundaries, and while the film falls short of taking this love to a physical level, the deeper feelings are perfectly conveyed in the eyes of the performers. Lillian Gish, perhaps the top silent actress at that time, was 23 when this film was made. Despite her age, she is extremely effective in portraying a shy 15-year-old girl who has found kindness and love in the most unlikely of places. Great review! Do you link your reviews at IMDB? I get some traffic from there. You have to have an IMDB account (free) and then go to the movie page, so for example Broken Blossoms, find Reviews, go to the critic section and at the bottom Edit Page. I think it helps with the google ranking also to have a place like that linking to you. Robert: Thanks! Glad you enjoyed it. I do have a good number of my reviews on IMDB (though, admittedly, this is not one of them), but I appreciate the suggestion (and the instructions) all the same. Thanks again, sir, for another great comment!